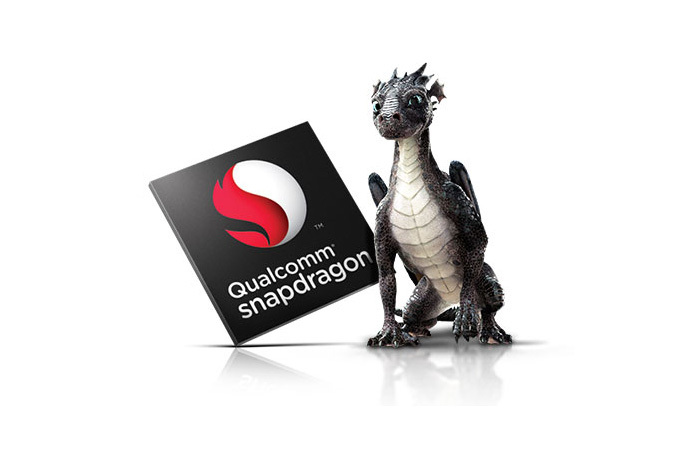 The Snapdragon 415 and 425 are additions to the low-end of Qualcomm's SoC offerings. The Snapdragon 415 is described a "quick transition piece" to the Snapdragon 410 which we suspect means it will be a pin-compatible SoC upgrade. It doubles up on the core-count from 4 A53 processors up to 8. The cores are still clocked in at the same 1.4GHz frequency. On the GPU side we see an upgrade from the Adreno 306 to a newer Adreno 405 and memory speeds have been slightly bumped from 533MHz to 667MHz LPDDR3, dropping LPDDR2 capability from the SKU. The Snapdragon 425 is also a octa-core A53 unit with the same GPU implementation, but clocked at a slightly higher 1.7GHz on the one of the A53 clusters. It's on the integrated modem side where things change, as the S425 employs a new integrated "X8 LTE" Category 7 LTE modem versus the Category 4 one found in the S415. The new unit also brings down the dual-ISP feature from the higher-end SoCs to the entry-level, enabling dual cameras up to 21MP. This should be an interesting SoC in the entry range as the specifications in terms of performance seem to match the Snapdragon 615 of the mid-range series. While the entry range gets some large performance and connectivity boosts, today's biggest news comes in form of the Snapdragon 618 and 620. These are the first announced Cortex A72 SoCs, ARM's new high-end CPU architecture which was publicly announced just two weeks ago. The Snapdragon 618 and 620 bring dual-channel memory back into the mid-range, employing LPDDR3 targeted at 933MHz, making them on par with today's Snapdragon 800 and 801 SoCs. The new offerings now employ full HEVC (H.265) hardware encoding and decoding, a feature first seen in the Snapdragon 810. Similarly to the 425, the usually high-end dual ISP functionality is brought down into the new SKUs and offer up to 21MP camera sensor functionality. What Qualcomm doesn't specify though, is the GPU. We're being promised a new "next-generation" Adreno GPU, so we might be talking about a new 500-series, but we don't know for sure until Qualcomm actually announces the new architecture. The Snapdragon 618 and 620 employ Qualcomm's new "X8" integrated modem solutions, capable of Category 7 LTE with up to 300Mbps downstream or 100Mbps upstream via 2x20MHz carrier aggregation on either upload or download channels. Getting back to the CPU configuration: The Cortex A72 replaces the use of a higher-clocked A53 cluster as the "big" part of these new big.LITTLE SoCs. The A72 was announced as ARM's new flagship high-end core, so it's very interesting to see Qualcomm employ it in a mid-range SoC at only 1.8GHz. It would look like these new units are still manufactured under 28nm given the clock speeds. We still don't know much about the A72 core, but ARM's Peter Greenhalgh clarified that we should be seeing a 10-50% IPC gain over the A57 while improving power on the same process node and libraries. To see Qualcomm use the A72 in a mid-range SoC begs the question of exactly how big these new cores are, as pricing is be an important competitive factor below the high-end. Qualcomm expects the Snapdragon 415, 425, 618 and 620 to ship in consumer devices in the latter half of 2015. This is an interesting timeline as the 618 and 620 pose direct competition to the Snapdragon 808 which we still haven't seen announced in any consumer device. On the high-end, Qualcomm is still keeping very quiet as we still don't know what the successor to the Snapdragon 810 will look like or what the state of Qualcomm's new ARMv8 core is in. 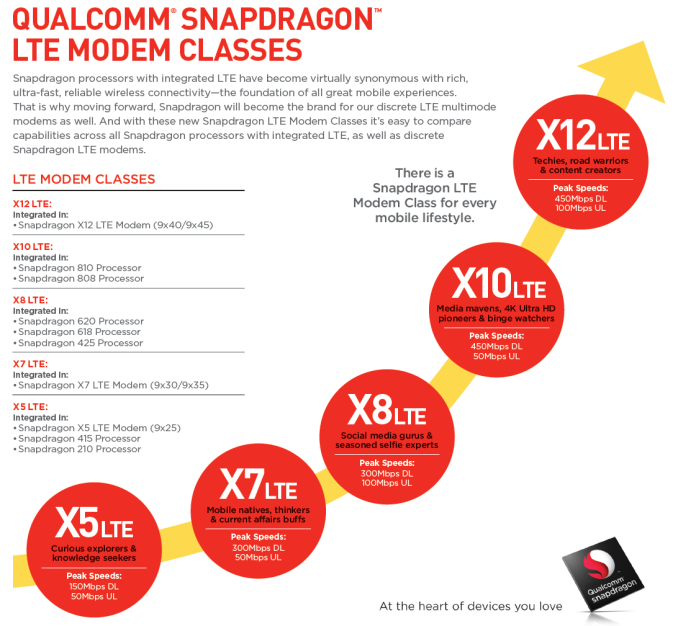 Finally as part of today's announcement, is a re-branding of Qualcomm's modem line-up. The "Gobi" name is abandoned in favour of a "X# LTE" denomination. It's to be noted that the model numbers don't correspond to actual LTE category capability, as for example the X10 and X12 modems are capable of respectively Category 9 and 10 LTE. The aforementioned parts are re-brandings of the modem variants which we find in the standalone Gobi 9x45 and 9x40 and Snapdragon 808 and 810 SoCs. Today Qualcomm raised the bar for low- and mid-range SoCs and we're looking forward to what kind devices Qualcomm's OEM partners will come up with towards the end of the year. The big question mark is the high-end. TSMC's endless delays means we're unlikely to see 16 nm FinFET this year despite all their hype. Samsung are the only ones beside Intel on 14 now, and they are trying to steal Qualcomm's lunch at the high-end, so they won't give access to fabs. GloFo could but they are behind a few quarters. Qualcomm's Krait ARMv8 is now shrouded in mystery. Will we even see it this year? I mean Qualcomm must be hoping so, because the midrange S620 basically nullifies the S810. Next announcement in line is probably Snapdragon 815 and 820 which will be the flagship chipset in entire market. Samsung's "14nm" is PR bull, it's the 20nm process they have now transferred to Finfet, meaning it's a nigh equivalent process to Intel's 22nm finfet, just like TSMC's upcoming "16nm" process is. Intel's process is optimized for regular layout so they have an advantage. As foundries, TSMC and Samsung need to leave more flexibility to their customers and be less restrictive in terms of uniformity requirements and this forces them to design rules that are less dense. This has always been the case: it's only exacerbated by the smaller nodes. In the end, it really depends what your focus is. From a pure density perspective, yes, you're completely right. From a speed vs power consumption perspective, however, it'snot so easy. Imagine what AMD's chips would consume using 16nm node instead of 28nm (~4x scaling in gate area), just to make an example.